Arctic Deeply’s partner site OpenCanada is featuring excerpts from the finalists in the Shaughnessy Cohen Prize for Political Writing. 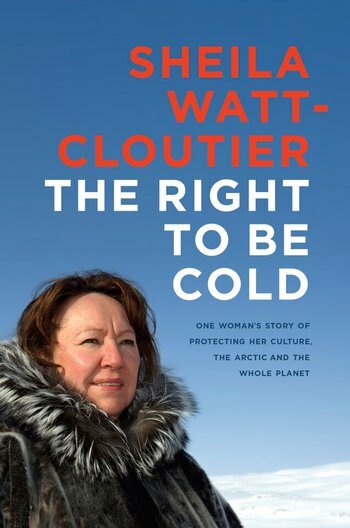 Here is Sheila Watt-Cloutier’s The Right to Be Cold: One Woman’s Story of Protecting Her Culture, the Arctic and the Whole Planet. Each year, the Writers’ Trust of Canada awards C$25,000 (around $19,500) for a work of literary non-fiction that has the potential “to shape or influence thinking on Canadian political life.” This year’s Shaughnessy Cohen Prize for Political Writing will be awarded on April 20 at the Politics and the Pen event in Ottawa. In advance of the event, Arctic Deeply’s partner site OpenCanada is running excerpts from all five finalists, including The Right to Be Cold: One Woman’s Story of Protecting Her Culture, the Arctic and the Whole Planet, by Sheila Watt-Cloutier, an environmentalist and activist. The following passage is excerpted from The Right to Be Cold: One Woman’s Story of Protecting Her Culture, the Arctic and the Whole Planet by Sheila Watt-Cloutier. Copyright © 2015 Sheila Watt-Cloutier. Published by Penguin Canada, a division of Penguin Random House Canada Limited. Reproduced by arrangement with the Publisher. All rights reserved. The world I was born into has changed forever. For the first ten years of my life, I travelled only by dog team. As the youngest child of four on our family hunting and ice-fishing trips, I would be snuggled into warm blankets and fur in a box tied safely on top of the qamutiik, the dogsled. I would view the vast expanses of Arctic sky and feel the crunching of the snow and ice below me as our dogs, led by my brothers, Charlie and Elijah, carried us safely across the frozen land. I remember just as vividly the Arctic summer scenes that slipped by as I sat in the canoe on the way to our hunting and fishing grounds. The world was blue and white and rocky, and defined by the things that had an immediate bearing on us – the people who helped and cared for us, the dogs that gave us their strength, the water and land that nurtured us. The Arctic may seem cold and dark to those who don’t know it well, but for us a day of hunting or fishing brought the most succulent, nutritious food. Then there would be the intense joy as we gathered together as family and friends, sharing and partaking of the same animal in a communal meal. To live in a boundless landscape and a close-knit culture in which everything matters and everything is connected is a kind of magic. Like generations of Inuit, I bonded with the ice and snow. Those idyllic moments of my childhood seem very far away these days. Today, while dog teams, qajaqs (kayaks) and canoes are at times still used to move out onto the Arctic land and water, snow machines are more common than dogs, and the hum of fast-moving powerboats is now heard on Arctic waters. All of our communities now have airports, medical clinics and schools, with some having hospitals, television stations, daycares and colleges. Our people still hunt and fish, sew and bead, but they are also nurses, lawyers, teachers, business people and politicians. The Arctic is a different place than it was when I was a child. And while many of the changes are positive, the journey into the modern world was not an easy one – and it has left its scars. In a sense, Inuit of my generation have lived in both the ice age and the space age. The modern world arrived slowly in some places in the world, and quickly in others. But in the Arctic, it appeared in a single generation. Like everyone I grew up with, I have seen ancient traditions give way to southern habits. I have seen communities broken apart or transformed dramatically by government policies. I have seen Inuit traditional wisdom supplanted by southern programs and institutions. And most shockingly, like all my fellow Inuit, I have seen what seemed permanent begin to melt away. The Arctic ice and snow, the frozen terrain that Inuit life has depended on for millennia, is now diminishing in front of our eyes. We are accustomed to the dire metaphors used to evoke the havoc of climate change, but in many parts of the Arctic the metaphors have already become a very literal reality. For a number of reasons, the planet warms several times faster at the poles. While climate experts warn that an increase of two degrees in the global average temperature is the threshold of disaster, in the Arctic we have already seen nearly double that. As the permafrost melts, roads and airport runways buckle. Homes and buildings along the coast sink into the ground and fall into the sea. The natural ice cellars that are used for food storage are no longer cold. Glaciers are melting so fast that they now create dangerous torrents. The world becomes focused and horrified only by haunting images of polar bears struggling to find ice, but hunters too are finding that the once reliable ice can be deadly. The land that is such an important part of our spirit, our culture, and our physical and economic well-being is becoming an often unpredictable and precarious place for us. I worry not just as an Inuk, but as a grandmother too. In our culture, hunting has taught us to value patience, endurance, courage and good judgment. The hunter embodies calm, respectfulness, caring for others. Silatuniq is the Inuktitut word for wisdom – and much of it is taught through the experiential observation of the hunt. The Arctic is not an easy place to stay alive if one has not mastered the life skills passed down from generation to generation. Mistakes can be fatal. But every challenge teaches a lesson, not only about the techniques of thriving in a cold world but also about developing the character that can be counted upon to stand up to those challenges. It is the wisdom of our hunters and elders that allowed us not only to live but also to thrive. As you are taught how to read the weather and ice conditions and how to become a great hunter or a great seamstress, you learn to become focused and meticulous, for your family depends on these skills for survival. This is the wisdom our hunters and elders have shared with our children for generations, and this holistic approach to learning is an essential part of Inuit culture. My hope for my grandsons is that they will inherit a good part of this culture. But this important traditional knowledge has begun to lose its value as a result of the dramatic changes to our environment. This wisdom, which comes from a hunting culture dependent on the ice and snow, is as threatened as the ice itself. The environment and climate I grew up in was indeed rich in lessons, and not just those that build character or help us on a hunt. Our intense affinity with the land and with wildlife taught us how to live in harmony with the natural world. Our traditional hunting and fishing practices do not destroy habitat. Nor do our practices deplete animal populations, or create waste. We use every part of the animals that we harvest. In other words, for thousands of years, Inuit have lived sustainably in our environment. We have been stewards of the land. All this wisdom, too, is threatened by the changing climate. That is to say, if we allow the Arctic to melt, we lose more than the planet that has nurtured us for all of human history. We lose the wisdom required for us to sustain it. And when I say we, I do not mean only Inuit. It is true, we are already among the first to be devastated by climate change, but we are not the only ones. A version of this article first appeared on OpenCanada. It is republished here with permission. Sheila Watt-Cloutier is a Canadian Inuit activist. She is the author of The Right to Be Cold: One Woman’s Story of Protecting Her Culture, the Arctic and the Whole Planet.